The performer looks tidy. 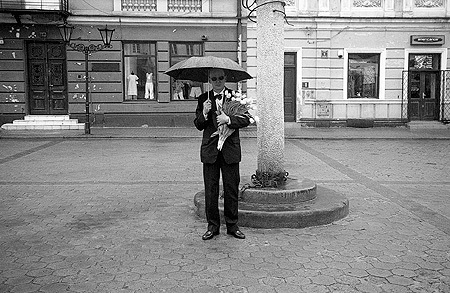 He wears a tuxedo and in his hand he has a bunch of flowers. He stands at a public place. Is he waiting for somebody? Due to the performer's own words he is not waiting for anybody, but is just as a beautiful view for the people who would pass by. He stands at the choosen place(s) for several hours, until the flowers drop.